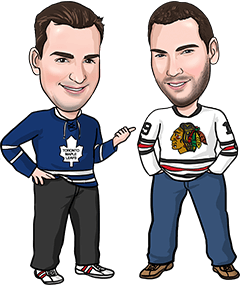 Welcome back for our second season of NHL Tips! It’s great to have you back with us for another year of NHL hockey betting. We finished the regular season with a record of 103-93 for +4.2 units. But that’s just part of the story. It was a huge roller coaster ride, just like NHL betting always is. We were up to nearly +20 units by mid-March, then hit a really cold stretch that actually put us a little bit into the red, then we rebounded to finish the year on an 8-3-1 run to get back into the black. If you were betting $100 on all of our plays, you’d be up $420 – not shabby, but a number we totally hope to improve on this year. In training camp for any sport, you hear the stories about how all the teams are so excited to open the year with a fresh slate. Possibilities are endless and optimism abounds. The same is true for betting. There’s something about the start of a new season that brings such excitement about the months ahead. We’re thrilled at the chance to help you try to make some money, but we’re also eager to take on the challenge (and it is a challenge, no doubt) to beat the oddsmakers at their own game. A couple of things are changing about how we are doing things this year, just so that we can balance this site with our other work and family commitments a bit better. The Coles Notes version of the changes is that we’ll be emailing out our picks a bit later in the day (they’ll still be out at least half an hour before the earliest games begin), and that we might not have writeups on as many picks (we’ll try to always have a writeup for our Best Bet, though). For a longer explanation of how our picks will work this year, if you’re new to the site or if you just forget (it’s been a long summer), check out our What to Expect From Our NHL Tips page. Alright, that’s enough about that. Good luck to you this season, and don’t forget to follow us on Twitter or Like us on Facebook. The Flames opened at +120 underdogs in this game and the line has gone down a bit on Calgary, but there’s still plenty of value to take the Flames in our opinion. This is the first game for Edmonton in their new rink, Rogers Place, and there’s a ton of excitement about opening a new barn. That can also mean a lot of pressure on a young Oilers team (when aren’t they young, seriously? ), and you know the Flames would be more than happy to spoil the housewarming party. Calgary has long had the upper hand in this Alberta rivalry, winning 39 of the last 56 meetings and 20 of their last 28 visits to Edmonton. It’s also the debut of Flames goaltender Brian Elliott, who led the NHL in save percentage last year. Netminding was a big reason Calgary struggled in 2015-16, and we think that makes the Flames an underrated commodity going into this season. Yes, this is a grudge match for the Kings, who were knocked out of the playoffs in the first round last season by San Jose. But we’d put more stock in that if this wasn’t the Sharks’ first game of the season as well, so motivation should not be a real advantage for either team in this one. We simply think San Jose is a better team than Los Angeles going into this season, and the -130 price to get the defending Western Conference champions on home ice seems like a good bargain. San Jose is 35-17 in its last 52 home games against the Kings and we expect them to continue that dominance of their California rivals tonight.